Happy Adventuresome August 1st! Today I have a double dose of August for you. First, we are kicking off the month with a new set of tunes. This month I included a special song by Grace Potter that was one of my favorite parts seeing her live a few weeks ago (She is BY FAR one of my favorite artists!) and another from ZZ Ward who opened up for Grace and hails from nearby Portland, Oregon. She was fantastic to watch and I recommend seeing either of them live if you ever have the chance. These playlists can't compare to seeing these talented individuals in person. There's just something about live music, dancing in a crowd, the moments with the artist between songs, and taking home a piece of their energy with you. Not to mention tucking away a memory that will come out and join you every time you hear your favorite song. Second, is the first photo post for August Break. The above album cover was created from a recent Instagram post about those hot pink heels. They are just one of the many personalities that I tried on at the thrift store in late July. It's funny (or weird) and ties in a little bit with this month's theme of Adventure. Sometimes when I am perusing the racks I get the urge to try on items I would never buy or normally wear...well...because you never know what you might find out about yourself when you walk in someone else's shoes or tip another person's hat. These lovelies let me dabble for a bit in the girlie-girl world, ooooh and ahhh over my favorite shade of pink and exaggerated bows, pretend that I wouldn't twist an ankle during high pressure days trotting around in trendy platforms, and then slide back down to earth before I literally fall down. It's nice to test the waters, to push my style boundaries, and wonder how I would carry myself in these items. Part of my self exploration I guess. So, until tomorrow. Enjoy some new music and think about new ways to step just outside your comfort zone. Sometimes even a quick baby step can bring a world of adventure. 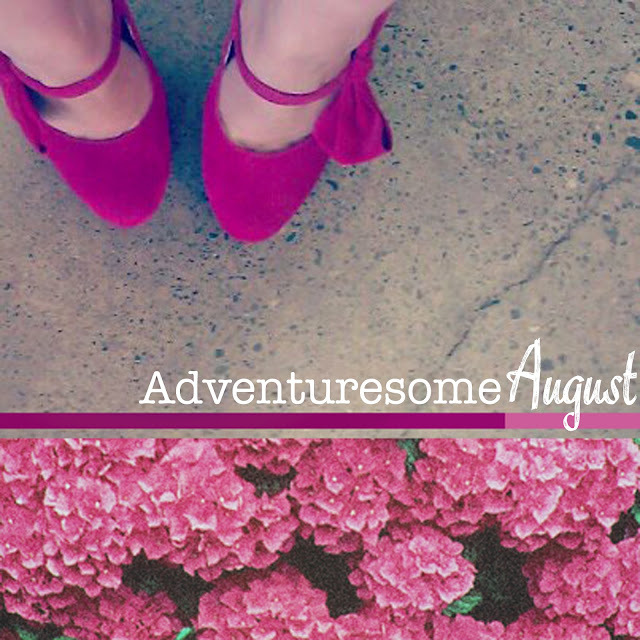 Adventuresome August 2012 from joyful_life on 8tracks.